Most people are simply frightened by insects and spiders. Especially if you live in a house with a big yard, then you frequently come across these pesky bugs. You may have tried numerous commercial products in order to repel bugs and spiders, but despite their limited potential, you should be aware of the fact that they are loaded with harmful chemicals. On the other hand, you can naturally eliminate them and finally fight your arachnophobia. This is how! Even though you may think that over-the-counter insect repellents are the easiest and most effective way to solve this problem, natural repellents are much more efficient, and do not contain any of the chemicals in the commercial products! Spiders simply hate citrus fruits, so if you have some lemon essential oil, you can effectively eliminate them. Moreover, you can also rub some peels of lemons and oranges on areas where spiders appear, such as baseboards. Cedar can repel spiders from your closets, by placing cedar blocks in your cupboards and closets, as well as your garden. Additionally, you can purchase cedar hangers and forget about spiders, as well as moths, near your clothes! You probably already know that vinegar is one of most versatile items you can use in your home. Its smell keeps ants, mosquitoes, and spiders at bay. 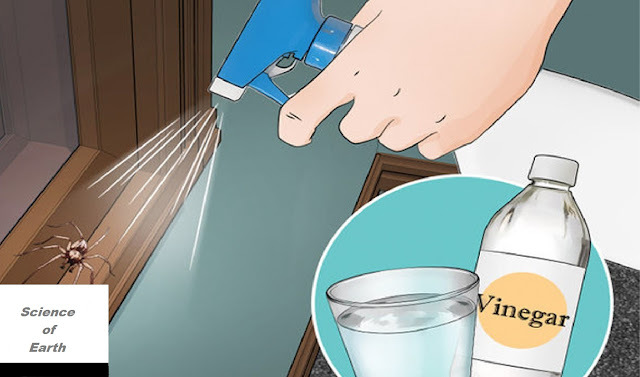 You can prepare a natural repellent spray, by mixing 1 part vinegar in two parts water, in a spray bottle, and spray all around the house and the yard. Spiders hate peppermint as much as we love it! You should make a natural repellent, by mixing 8 drops of essential oil, with a bit of liquid dish soap, to help spread the oil molecules in the water in a spray bottle. If the solution does not smell minty enough, you can add 8 more drops of peppermint essential oil. Shake the bottle well, and then spray it all around the house. Furthermore, you can mix vinegar and peppermint, and prepare another natural repellent. Tree nuts like chestnuts, walnuts, and horse chestnuts are effective in repelling spiders as well. Their scent includes a chemical which spiders cannot tolerate. You should place several on the windowsills and you will quickly solve this issue! Your home should be absolutely clean in order to prevent these unwanted guests. This means you’re your floors should be vacuumed and swept. We also advise a seasonal de-clutter, and you will be surprised how much space you actually have at home! Furthermore, make sure you also clean the outside part of the house. If you have a lawn, it should be cleaned of leaves, sticks, and clippings. Additionally, you should investigate whether you have some gaps in the doors or window sills. If you live in an apartment, regularly clean the balcony and windows. If you are one of those who are continually struggling to maintain their home spider-free, then, these tips will definitely be of great help!